Amosun Working To Install Ndume As Senate President? 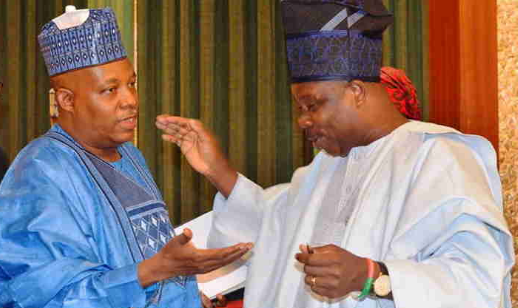 Outgoing governors of Ogun and Borno states, Ibukunle Amosun and Kashim Shettima, both senators-elect had long conversation on Tuesday during the orientation programme for new lawmakers. Now a lot of insinuations are playing up over their long meeting. Amosun has issues with APC national chairman, Adams Oshiomhole and National Leader, Bola Tinubu. He had refused to comment on insinuations that serving and former governors were plotting to install the 9th Senate President. His meeting with Shettima on Tuesday might be related with decision of the All Progressives Congress (APC) to adopt a candidate for the position. Their body language when they saw an aspirant to the position, Senator Ali Ndume, also fuelled the suspicion as the two governors also engaged the former senate leader in a brief discussion.